From February - April 2016, BPK PENABUR JAKARTA, a consortium of private Christian schools with more than 60 schools mainly in the western part of Java, organized an event titled, "Roadshow Smart Parenting TKK PENABUR Jakarta 2016." Smart Parenting focused on informing parents about their children’s development stages, ensuing problems and proper methods to deal with these problems. There were eight schools from different areas of JABODETABEK that participated in this program: TKK PENABUR Gading Serpong, TKK 8 PENABUR, TKK PENABUR Kota Jababeka, TKK PENABUR Kota Wisata, TKK PENABUR Summarecon Bekasi, TKK PENABUR Harapan Indah, TKK 7 PENABUR, and TKK PENABUR Depok. Various activities were held during the event such as Fish Catching, Monas Paper Crafting, Young Broadcasters, Build Your Box Competition, and Happy Family Picture Competition. 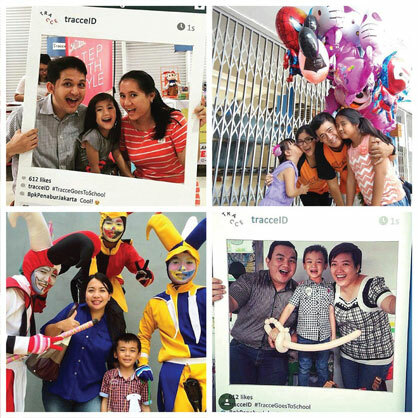 Excited families enthusiastically took part in the competition, as can be seen from the numerous pictures uploaded with the hashtag #TracceGoesToSchool. Thanks to all who participated and hope to see you again in our next Road Show!